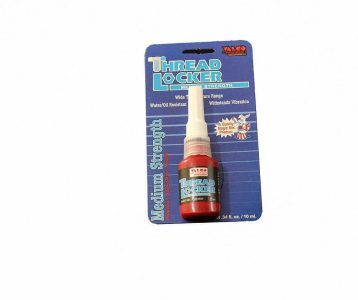 ThreadLocker anaerobic compounds are great for locking, retaining, sealing and gasketing a variety of components. ThreadLocker compounds perform at high temperatures, prevent corrosion, and resist water, oils, hydrocarbons and more. They also withstand vibration, improve load distribution and act as a lubricant during assembly. A durable plastic seal cures in the absence of air when activated by a metal component or primer. Thread Locker Medium Strength will be added to Cart!